Charlotte MacInnis moved to Tucson in 2017 after a career in show biz in China. 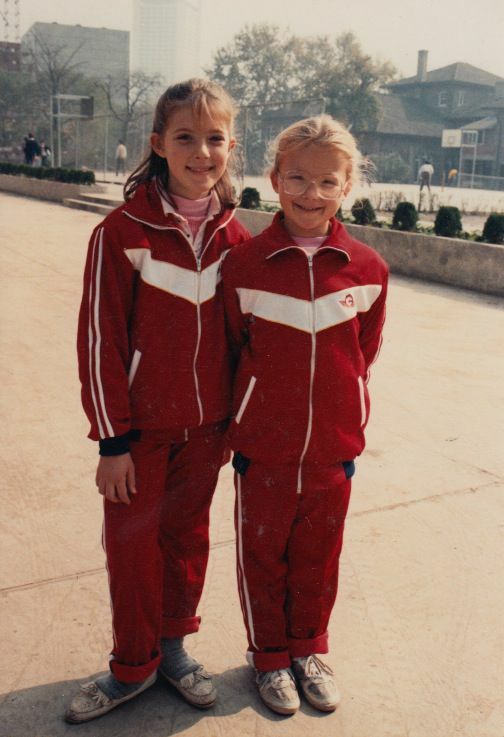 The MacInnis sisters pose in their new school track suits in Nanjing in 1990. Charlotte MacInnis, left, and Mika MacInnis, right, film a music video for excerpt from various Chinese operas in 1994. Both are dressed as the protagonists from the Chinese novel-turned-opera "Dream of the Red Chamber." Charlotte MacInnis, left, hosts the televised talent competition "Arts of Our Land." Charlotte MacInnis and her husband Joshua Hannum met at the International School of Beijing as high school students. Pictured from left to right, Elyn, Peter, Charlotte and Mika MacInnis visit Nanjing in 2004. The family lived there from 1988 to 1995. Charlotte MacInnis hosts an event in Beijing after returning from university in the U.S.
Can you find Charlotte and Mika MacInnis among all of their schoolmates doing morning exercises at their primary school in Nanjing? Every now and then, Charlotte MacInnis encounters a Chinese student at the University of Arizona who cannot believe they're meeting her in the flesh — in Tucson, Arizona of all places! "Sometimes it's like, 'Oh. You're that girl!' or 'I watched your show while I was growing up' or 'I learned English or Chinese from you,'" she says. "Very rarely do you get someone who has a starstruck reaction." But it does happen. Charlotte, after all, spent about 25 years appearing on Chinese television in various roles. Her stage name is Ai Hua, which means "to love China." Her show biz career began when she and her older sister Mika MacInnis emceed the opening and closing ceremonies of a conference in both English and Mandarin in Nanjing, China in 1991. That girlhood appearance morphed into performing on variety shows and eventually hosting game shows, talk shows and live events. And as a Caucasian American with a solid grasp of the language and culture, Charlotte left an impression. "When you stand out, whether because you're a foreigner and look different or because you're on TV, you're standing out either way," says her sister Mika, who is now a psychologist in Rhode Island. The family's move to China came during a period when it was uncommon to encounter foreigners, especially children, Charlotte says. Because of that, Charlotte and Mika grew accustomed to turning heads even before they made any sort of television appearance. Now it's not uncommon to, say, be in an airport and meet someone from Australia who watched one of Charlotte's Chinese programs, says Joshua Hannum, her husband. Charlotte, 38, moved to Tucson from Shanghai in 2017 and now works for UA Global as assistant director of the department's China programs. She previously worked at the university's Confucius Institute. The director of the UA Confucius Institute, Zhao Chen, says she recognized Charlotte's name when she applied. "A lot of our teachers at the Confucius Institute were thrilled hearing that Ai Hua would be a colleague," she says, laughing. Charlotte has since co-hosted two Spring Festival Galas for the institute, delighting audience members who recognized her from Chinese television. "In the Chinese community here, a lot of people have heard her name," says Chen, who is also a public health professor at the university. "Maybe the younger generation has not heard of her, but their parents have." And while Charlotte certainly attracted attention as a foreigner who spoke the language, Chen adds that her familiarity with the culture made a significant impact. "I think people see her as this icon," Chen says. "She knows both cultures, so she can easily translate one culture to another, and people notice that. It's so smooth." And that's really Charlotte's mission. She wants to help other people understand the country that became her home. "It just so happens that I was born in the States but spent most of my life in China," she says. "I'm in a position to navigate both worlds." The MacInnis family moved to the city of Nanjing, the capital of China's Jiangsu province, when Charlotte was 7 and Mika was 9. Moving from West Hartford, Connecticut, Charlotte says when her parents returned home from a pre-move visit with stories of beautiful rain flower stones sold by vendors on the streets, she imagined the hot dog carts of Manhattan piled with mounds of polished stones. "When we got to Nanjing, it basically amounted to sweet grannies and grandpas squatting on the side of the street with a burlap sack and stones," Charlotte says. "It was totally different from what I was imagining." Charlotte says her family's ties with China go back to her grandfather, who moved there in the late 1940s after visiting as a college student and then serving there with the U.S. military during World War II. Her father was born in China and grew up in Taiwan, so a move back to Asia wasn't totally unexpected for the family. In 1988, the MacInnis family moved to Nanjing. After several months working with a Chinese tutor, it was time to start school. Because there was no international school in their area, Charlotte and Mika spent the mornings in the classroom with their Chinese peers and the afternoons working through an American curriculum at home. Learning Mandarin was a necessity. "School in general in those days was so different from what we were coming from in the States," Charlotte says. "Back then, it was in a cement building and cement classroom with leaky windows ... and discipline is pretty strict in Chinese schools, so you just sit at your desk with your hands folded and don't move until your teachers say you can. That took some getting used to, but when everyone is doing it and cool with it, it just quickly becomes your norm." Charlotte recalls a photograph taken from a balcony of the school overlooking a courtyard, where the whole student body was outside for morning exercises. She notes that she had particularly blonde hair in these years. "You look down at all of the kids and it's like a 'Where's Waldo?' thing," Charlotte says. "Find Mika and Charlotte. And you can, too!" The staring took some adjusting. "If I went to the department store to buy shoes or vegetables or anything, I would get a circle of people around me just staring," Charlotte says. "It wasn't hostile or making fun of you. It was just, 'Wow. Let me look at this, because this is different.'" Not only were foreign children uncommon, but Mika and Charlotte's ability to speak and interact in Mandarin also attracted attention. That novelty earned them an invitation to emcee opening and closing ceremonies for an international conference in the province where they lived. There, they met and befriended a professional children's performing arts troupe then called the Little Red Flowers Song and Dance Troupe. The girls began taking singing lessons, eventually learning traditional Chinese opera. "The kids in that troupe really didn't look at us and see little foreign kids, but looked at us and saw fellow performers," Mika says. A provincial television station invited the girls, 11 and 13 at the time, to dance on a televised variety show — a popular form of entertainment there. "My sister was this delicate, graceful willowy young girl, and I was more of a tomboy and not as graceful at that age, so I couldn't do the dance very well," Charlotte says, laughing. "I gave it all I had, but it didn't pass muster." Instead, the girls sang. And if it was unusual for American girls to speak fluent Mandarin, it was even more unexpected for them to perform Chinese opera. They learned Chinese folk songs and Chinese comic dialogue, a scripted exchange they thought would improve their language proficiency. The television invites kept coming, and suddenly, they were appearing on national television. Charlotte got her stage name, Ai Hua, as a joke in a comic dialogue skit. She was originally dubbed Ai Su to Mika's Ai Jiang in a regional broadcast. Their names together – Ai Jiangsu — meant "to love Jiangsu," the province where they lived. Now, the sisters were turning heads for different reasons. "It was a shift from 'Oh look. There are foreign kids,' to 'Oh look. There are Ai Jiang and Ai Su,'" Mika says. When they were asked to do the skit on national television, they changed their names to Ai Hua and Ai Zhong, or together Ai Zhonghua, meaning "to love China." The family spent summers back in the U.S., where "nobody knew us from the next person in America," Mika says. The rhythm added some normalcy to their lives and the children's art troupe distilled a strong work ethic in them, she adds. "We didn't have that feeling of 'oh my goodness, you're so special,'" Mika says. "It was more like you had to work hard and put time and effort into what you're doing, because if you're not doing it well, we'll pick somebody else." The family moved to Beijing from Nanjing in 1995. Two years later, Charlotte co-hosted "Laughing Teahouse," a skit that ran within the popular game show "Zheng Da Zong Yi" in the 1990s. That show was broadcast on CCTV1, the main channel of China's national network. This was her first recurring role — as opposed to the one-off variety shows. "We filmed in chunks, like 20 episodes over the course of a week during vacation," she says. "I was a senior in high school and I didn't care about all of that. I was focused on class and homework and friends and whatever else seniors in high school are focused on." As a student at the International School of Beijing, Charlotte found herself in class with students from around the world. It's also where she met her would-be husband — another American who grew up in China. Hannum says going to school with Charlotte then was like attending school with a sitcom star from another country. "In an international culture full of students from other areas, it doesn't click," he says. As part of a class trip to visit a Chinese college campus, the university prepared a small performance to welcome Charlotte's class. She says her teacher scrambled to reciprocate, recruiting one girl to play the violin and several other students to sing. "One of the teachers knew I had done some work in opera and asked me if I would mind singing something, and I was like, 'Yeah, sure,'" Charlotte says. "I didn't realize what would happen." The Chinese college students — unlike Charlotte's classmates — recognized her. "The minute I got up there and started speaking Chinese, it was over after that," she says. "And all of my classmates got this weird look like, 'Who are you and why is this happening?'" After returning to the U.S. to study drama and theater arts at Columbia University, Charlotte decided to go back to Beijing in 2002, this time as an adult ready to make entertainment a professional career. "After I went back following college, I wasn't a kid living with my family," she says. "My colleagues were Chinese, and my friends were Chinese, so I was more in a Chinese life and rhythm. My language just deepened, and I think my understanding and awareness of the nuances and culture also deepened." Upon returning to China, she hoped to support herself by acting but quickly found a shortage of parts for a Caucasian woman — especially one not interested in playing an ignorant foreigner. "I didn't spend my whole life in China to end up playing that role," she says. Instead, she turned to hosting live events and game and talk shows. Much of her work focused on cultural exploration, especially as her career progressed. "It does happen where you have a token foreigner on a show, but Charlotte never fit that mold..." says Hannum, who also acted in China and worked as a model. "Because of her upbringing, she could talk about the same thing from primary school that Chinese people could, and she had the same experiences and grew up when China was still coming through a huge amount of change." Charlotte says she received one of the best compliments while exiting a department store elevator in a less international part of China. As she and a good girlfriend left the elevator, a third woman who rode with them pulled Charlotte's friend back to ask her a question. "Where did she get her plastic surgery done?" she asked. "It looks so good." Charlotte still laughs in delight at this story. Her language proficiency and understanding of cultural cues had convinced the other woman that she was Chinese. In reality, she admits that as an American who grew up and worked in China for years, her identity feels scrambled. She says in the later years of her career on Chinese television, she intentionally leveraged her unique perspective, appearing often on cross-cultural talk shows in both languages or teaching language. "On one morning show, where I appeared as a guest, we just talked about things in China and tried to put them in perspective for people in other countries," Charlotte says. As for appearing on state television, Charlotte says there were just certain things you didn't talk about. "You don't talk about religion, and you don't talk about politics, but that's fine with me..." she says. "What I was doing was more cultural stuff. It wasn't sensitive stuff." Over the years, she has fielded plenty of questions from Chinese friends curious about the U.S. and American friends wondering about China. She wants to help bridge that understanding gap between the two cultures. "So much of my work in my more focused, serious years — the past 10 to 12 years — has been focusing on doing this cultural bridgework and acting as an ambassador of the outside to China..." she says. "I felt like it was time to come do the reverse on this end." When Charlotte and Hannum moved to Tucson from Shanghai in May 2017, they came seeking sunshine and career changes. They joke that Charlotte could technically retire — she spent about 25 years performing, after all. "My brother is in Tucson and her sister is in Rhode Island, and we were between the two places," Hannum says. "But we were also coming from Shanghai which is cold and wet and damp, and whenever we thought of Tucson, we thought of sunshine and blue skies." Although Charlotte didn't know specifically what kind of life she would pivot into, she hoped to continue her mission of creating understanding between American and Chinese perspectives. "I came here in 1988," says Chen with the UA Confucius Institute. "But I had heard her name ... it’s not just the language. The language is something you can learn in class, but the culture — how to behave and talk to people — it just blew you away. If you closed your eyes, you wouldn't know she was an American girl speaking." Charlotte now works as assistant director of China programs for UA Global, and Hannum got a job at the Arizona School of Acupuncture and Oriental Medicine and is poised to move into the interim president role in the coming weeks. Only occasionally does anyone here recognize Charlotte. And that's fine by her. "There is so much that I just love about China. China is home," she says. "But there is so much I'm learning to appreciate and love about the States, and I want to be able to bridge that gap for people."